The Mk5 takes off where the Mk4 left off with the addition of an 800 lumens white light LED. 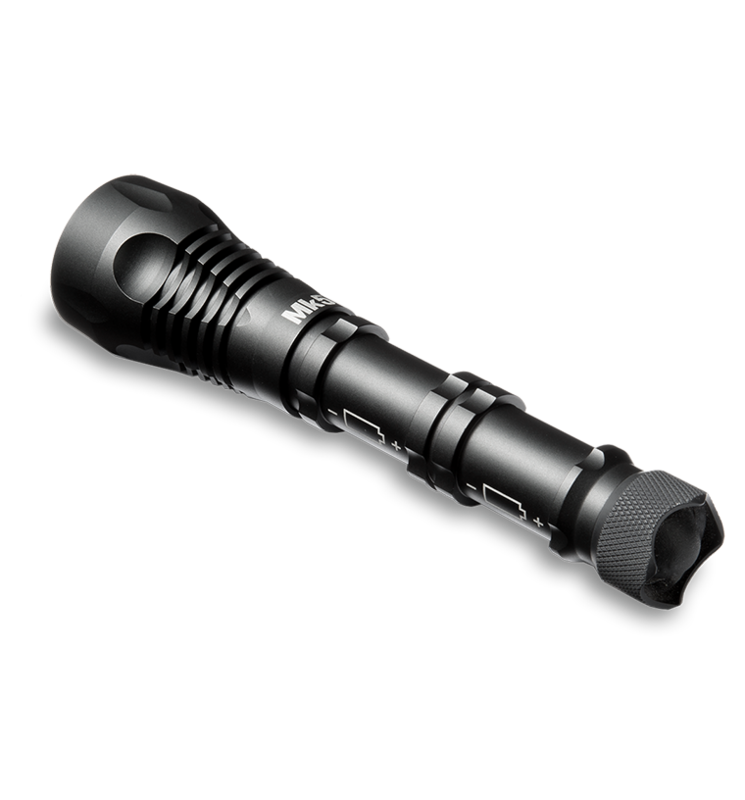 This powerful light illuminates to 500 meters, making the Mk5 one of the brightest pocket–sized, weapon-mountable flashlights available today. Mk5 Battle Light is rated 5.0 out of 5 by 1. Rated 5 out of 5 by Keystr0k from Best weapon mounted light I've ever used! I bought this light from a local dealer that was going out of business. My dad had a pair of Steiner binocs when I was a kid and he would never let me touch them unless he put them around my neck. He always raved about them so I knew the name was solid. First, the specs vs my experience: 1. Packaging: Clear acrylic locking box. Light was encased in foam. Nice. 2. Material: Aircraft Aluminum - It certainly is. 2. 800 Lumens - YUP! This thing is bright. And when I say bright, I mean bright. It lights up the whole room at night. Throw is nice too. More distance than I will ever use. 3. Weight (6.1oz w/ batt & mount) - I didn't get the mount but my light with batteries is 5.4oz. 4. Waterproof (5m): O-rings are installed in tail switch and in front of battery compartment which also seals off the LED compartment. I'm not putting this thing in water unless I have to, but I believe it to be waterproof as they state. Very solid. 5. Activation switch: Very solid feel with an audible click when activated and it has momentary-on functionality. This is accomplished by depressing the tail switch 1/8". It is covered by a rubber coating/cap. The switch is very solid when depressed, no mush or wobble anywhere. 6: Heat: As with any modern light, the forward half will heat up during use. Nothing out of the ordinary and it dissipates rather quickly when turned off compared to others I've used. 7: Battery Life: Greater than 1 hour. - New batteries lasted 1hr 18min 8. Modes: 2 - On and Off - Simple. If I have to clear my house in the middle of the night because I hear something, the last thing I want to worry about is how many clicks I have to perform to get the light mode I want. I want 1-click-ON and this thing does it perfectly every time! Overall, the build quality on the MK5 is nothing less than extraordinary. Solid from stem to stern is all I can say. The best things are usually the simplest and this light is exactly that. I can't say enough about this light. Buy it, you won't be disappointed. Whats the candela rating on this mk5 light? Flashlights are not usually rated in candela. We measure the output of our battle lights in lumens, and lumens can't be directly converted to candela. We can't guarantee these calculations are 100% correct, but here is our best estimate: 650 lumen unit = 42468 candela 800 lumen unit = 52268 candela We hope this helps. On the Mk-5 Battle Light , How long is thr Remote activation Cable. Thank You. The cables are 6 inches long. Can you use rechargeable CR123A batteries in the Mk-5 Battle Light? Will an 18650 work instead of cr123s? Item # 9165 is the mount kit. It can be purchased from any of our dealers or distributors. Can you please list the part # for the remote switch kit? Hi, Are any batteries or charger included? Also, what is the diameter of the body. The MK5 includes two (2) CR123A batteries. The diameter of the MK5 varies from the LED Head to the battery tube. The diameter of the &ldquo;body&rdquo; is just slightly larger than the diameter of a CR123A battery (~16.7mm). Is your MK5 Battle Light delivered as shown. With remote cable / back end adapter and mounting bracket for $275.00? How long is the Remote Cable?